David Wagner felt both sides could have won after his Huddersfield team drew 1-1 at Brighton this afternoon. 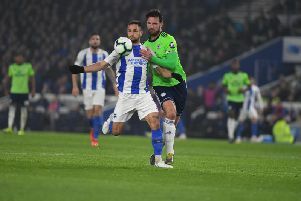 Jonas Lossl's own goal was cancelled out by Steve Mounie's equaliser in the first half, before Albion had to see out the final 15 minutes with ten men after Davy Propper was sent off for a foul on Jonathan Hogg. Wagner said: "In general, I'm happy and pleased with the performance. "I'm very pleased with the response the players showed after a difficult first four or five minutes and after we conceded a very unlucky goal, the response was great. "With the ball we played some decent football, we were able to win it and we were able to concede a defeat as well. Both teams wanted to win the game and I think it was a good football match. "There was a lot of pressure on both teams and I think they've both done very well and deserved a draw. "It's a stadium where the promotion atmosphere still is, we know this can help because we have it in the John Smith's Stadium. "How the players dealt with it was great and of course we were able to win, we had the opportunities but there were oppportunities for Brighton as well." On Propper's red card, Wagner said: "For me, it was a tackle which was too dangerous. "Last week we had a comparable tackle and we lost Kachunga for three months when Kenedy made a harsh tackle, which was from my point of view too dangerous. "Today was too dangerous as well. I've no problem with aggression and fighting spirit but you cannot risk that your opponent gets an injury, like what happened to us last week. "Hopefully Jonathan Hogg is not as seriously injured as Kachunga was last week but we have to make further assessments."